Cornwall Environmental Consultants is delighted to be the Lead Consultants to deliver the Truro Loops feasibility study for new cycle and walking links in and around Truro. 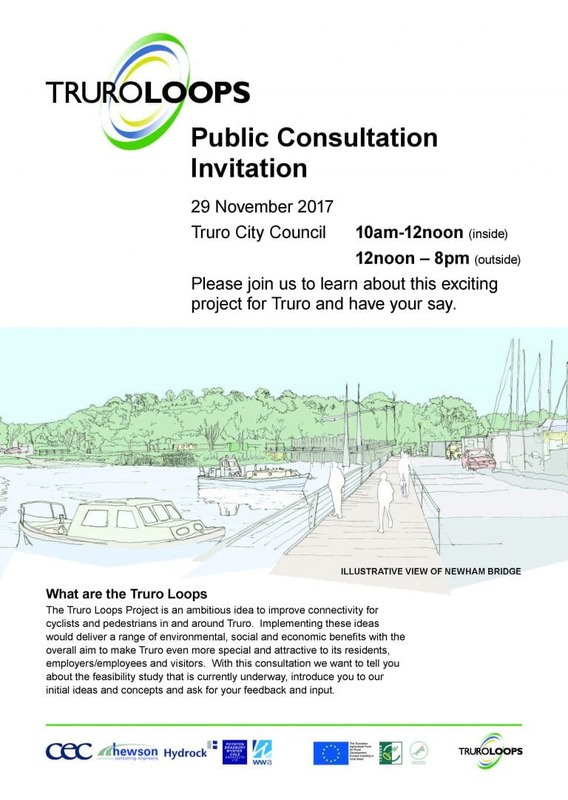 A public consultation event will be held on 29 November 2017 from 10am – 12noon at the Truro City Council offices, with the information then moving outside the offices into a street stall for the rest of the day. CEC’s team of Landscape Architects and Ecologists will lead the project over the next 4 months, working with Hydrock, Hewson Consulting, PBWC Architects and WWA Surveyors. The scheme builds on the original ideas community organisation Truro River Working Group (TRWG), which reached a major milestone in its Truro Loops campaign by securing funding and support from the Rural Development Programme for England earlier this year. Plans to link two new bridges, river walkways, and cycle trails into a series of ‘loops’ can now be fully explored.